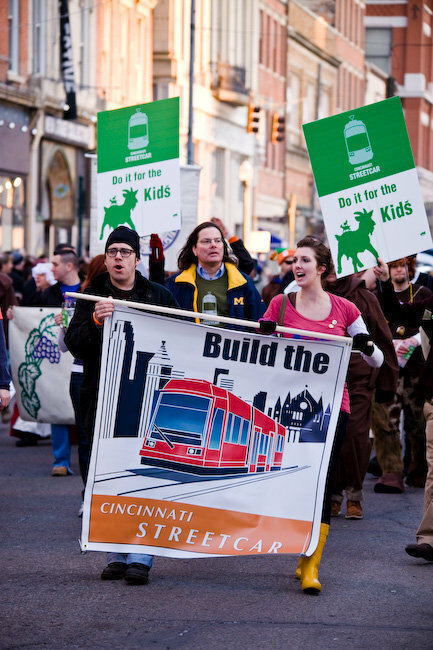 On March 23, Ohio’s Transportation Review Advisory Council (TRAC) was greeted by 32 Cincinnati Streetcar supporters. The residents and business owners went to Columbus to let their voice be heard on the state’s highest-rated transportation project that appeared ready to be gutted by a new administration set to cancel all investments in rail transportation. The presence of these individuals not only came as a surprise to many on the council, but also made several of the members reconsider the idea of making the state’s highest-rated project shoulder 52 percent of all proposed cuts in a “fiscal balancing” effort. “The number one rated project is recommended to take the brunt of the cuts…that’s a problem for me,” William Brennan stated at the March 23 meeting. Other council members, UrbanCincy‘s Jenny Kessler reported, shook their heads in agreement with Brenna as he made the statement. Fellow council member Antoinette Maddox suggested that all new projects be sunsetted, or that cuts be made to lower-ranking projects to avoid such drastic cuts to the state’s highest-rated transportation project. The public comments and debate made no impact on the TRAC’s recommendation that day as they followed marching orders to cut 100 percent of the Cincinnati Streetcar’s state administered funding. The results of the meeting, combined with an “unprecedented attack” on the streetcar project from Governor Kasich, lit a fire within many Cincinnatians who have supported the streetcar project for years. Groups began organizing to continue to show the TRAC their support for the project at the upcoming April 12 meeting where they will hold a final vote on the recommendation to strip the Cincinnati Streetcar of $51.8 million. Anticipating a large turnout for the April 12 public hearing, the TRAC has rewritten its speaking guidelines for such meetings. At the April 12 meeting only, the TRAC has restricted public comment to 40 minutes for the Cincinnati Streetcar project. Opponents will be allotted 10 speaker positions getting two minutes each. Supporters will get only seven positions with two minutes each, plus an additional six minutes for a representative from the City of Cincinnati, totalling 20 minutes. The TRAC has also stated that Room GA, in which the meeting will be held, will be open to the public beginning at 9am. The council also states that overflow seating will be provided in Room GB if necessary. The meeting is scheduled to start at 10am. Cincinnati Streetcar supporters photograph by Sherman Cahal.